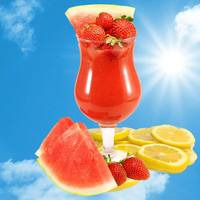 This is an intoxicating strawberry/watermelon lemonade recipe. It's another one that really impresses me with the level of balance that has been achieved by it's creator. When I decided to mix it, I was slightly worried that the lemonade would get overpowered, since LA lemonade is already on the mild side. However, the use of Italian Lemon Sicily really helps bring the lemon note forward, and brightens the recipe as a whole. The combination of Big Watermelon and LA Watermelon is a 10/10 candied watermelon flavor and it fits perfectly with the JF Strawberry Sweet. The slight cooling in the background gives a wonderful sensation of a cold drink, and the level of sweetness is spot on to the profile. This is my favorite lemonade recipe so far, and I highly recommend it.